With digital transformation comes the opportunity to use valuable data to not only benefit the organization but using that data to tell a story. Crafting accurate, relatable and helpful depictions of consumers’ paths through tools like success stories can help providers engage others in the community and more effectively appeal to potential clients. Learn how to best capture and leverage storytelling data to improve your organization and its impact on your community. Storytelling data comes in many forms, with client feedback as a valuable and essential piece in the most powerful story that BH organizations can share with others. If your team has the right technology and resources in place, you have an opportunity to collect data around your processes, assessments, service delivery and outcomes. But focus should also be placed on speaking with current or former consumers. Set up systems like feedback portals to regularly gather insights and reach out to ask if some consumers are willing to share their personal experiences. This can also involve working with their loved ones to get a clear idea of the full scope of their time with you. It’s equally as important to seek measurable, quantitative information by following outcomes data, such as the number of completed care levels, the average length of stay and the makeup of support engagement activity. The data your organization collects carries great potential for you and the lives you are changing every day — so use it. Many organizations may not have this exact role in-house. It may be more beneficial to call out the ease of sorting through good outcomes to create these captivating stories, rather than making it seem like a very difficult task that only a specialized content creator can pull off. 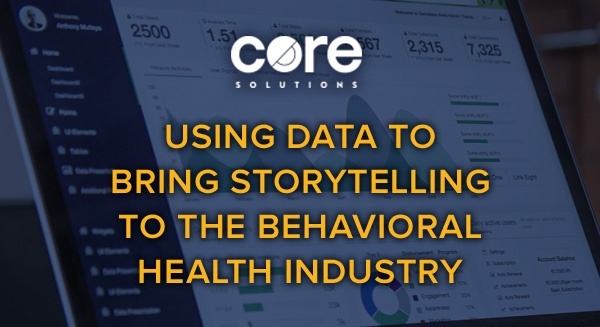 Here are some of the many ways storytelling can be used to build up behavioral health care organizations, their consumers and the industry as a whole. Communicating real, lived stories about the people in your programs should take precedence in your organization’s growth plan. As more well-crafted stories circulate, the behavioral health industry will grow and evolve, reaching more consumers who need care and creating awareness around the conditions and communities we serve. Capture better data to share your organization’s stories. Switch from paper to digital or explore the advanced features of a new EHR with Core. Request a demo of our integrated EHR solution today.